Finding Dory and its popular Pixar predecessor, Finding Nemo, are similarly pleasing, well-made mass productions that educate about marine life about as well as Gomer Pyle did about life in the Marine Corps. Sure, viewers might be introduced to the echolocation capabilities of a beluga whale, and the fact that an octopus has three hearts. But the lessons learned here are strictly human, and that’s where Pixar and Finding Dory flourish. 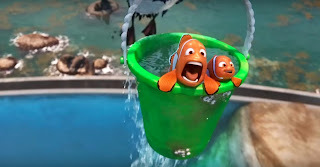 An opening origin vignette reveals that as a fish-ling, Dory (the film-carrying voice of Ellen DeGeneres) wandered away from her parents due to her chronic short-term memory loss. Now grown and living in her new aquatic home, she pesters neighbors Nemo (Hayden Rolence) and Marlin (Albert Brooks) at night and annoys a school class she tries to assist. When a faint echo of her mom and pop re-enter her minds, it prompts a search quest across the ocean to locate them. Dory is joined by Nemo and forever fussbudget Marlin, propelled by Dory’s gradual, convenient recollections, starting with the SeaWorld-esque park in Morro Bay, California where Dory was born. As expected, the fun of Finding Dory is the eccentric creatures we meet along the way. Most memorable is Hank (Ed O’Neil), a camouflaging, contortionist octopus who believes helping Dory is his best bet to catch the next truck to Cleveland (?). Most of the laughs come via Destiny (Kaitlin Olson), a near-sighted whale shark, a beluga whale with sonar anxiety (Ty Burrell), and a pair of sea lions (Idris Elba and Dominic West) who spend most of their time tormenting a simple-minded Sisyphus who struggles to share their rock, only to be constantly chased back into the sea. Indeed, there’s a bleak undertow to Finding Dory that may take young viewers aback. A lonely oyster pines for the mollusc who broke his heart. A deranged sea bird obeys anyone who maintains contact with its flitting eye. The institute is a purgatory filled with windup toys, barnacle-crusted corridors and feeding buckets filled with bobbing sardines. But the film’s most sobering aspect is also its most inspirational. Director Andrew Stanton delves into the dark recesses of Dory’s memory condition, a narrative that speaks equally to families coping with such similar disabilities as dyslexia and autism. It’s a sincere, frank and ultimately uplifting message, even if delivered by a serviceable sequel lacking the sense of discovery in its original.